Takeoff and price any job, up to 80% faster. In short, our software is designed to make your life easier. It gives you the ability to takeoff and price any job you like in no time. The package you choose determines how much time you’ll save. Essentials does what it says on the tin, giving you the basic tools to complete a quick and accurate takeoff. With the Pro level, you’ll also have a full set of powerful estimating tools, and all the relevant prices will be automatically counted up for you. Find out more on our Pricing page, or read on to learn more about how exactly the software works. Everything you need to start saving time on your estimates. Our best value option, with extra time-saving features and tools. Our most powerful solution to help maximise your profits. 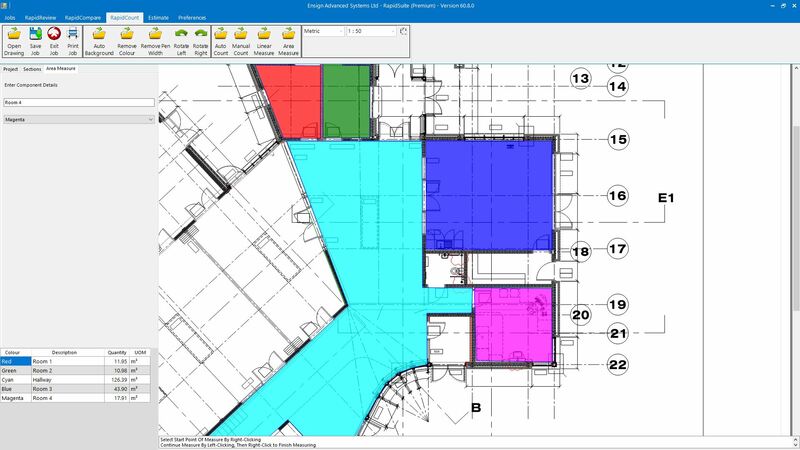 Chances are that if you’re reading this, you’re not using a construction estimating software to put together your quotes and tenders. If you’re like most tradesmen in the construction, electrical or landscaping industries, you still do your takeoffs by hand. There’s the printing of the plans, finding a quiet corner of the office or your house to spread out a few A1 and A0 sheets and the grabbing of the highlighters. Not to mention the hours of counting, checking and totalling. Then once that’s done, you’ve got to drop all those quantities into a spreadsheet so you can actually price the job up. It wouldn’t be so bad if those hours spent on the estimate were guaranteed to turn into paid work, but we all know most quotes don’t bring any money in. So why not get someone else to do it? Someone who can count quicker, never gets distracted and who only needs to be paid a couple of pence per day. Or not someone. Some thing. 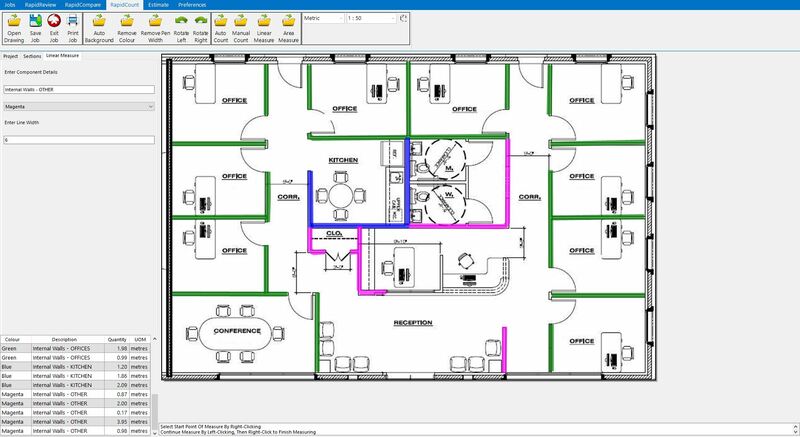 Like our quoting software -RapidQuote quantity surveying. Instead of sending the plans to the printer, run them through our program. In just a few minutes it’ll scale, count, colour and take off your quantities and give you a simple, easy-to-update spreadsheet. In go your suppliers’ prices, and out comes an accurate estimate. That’s all there is to it. Take off? Done. Estimating? Done. Quote? Ready. Time? Saved. 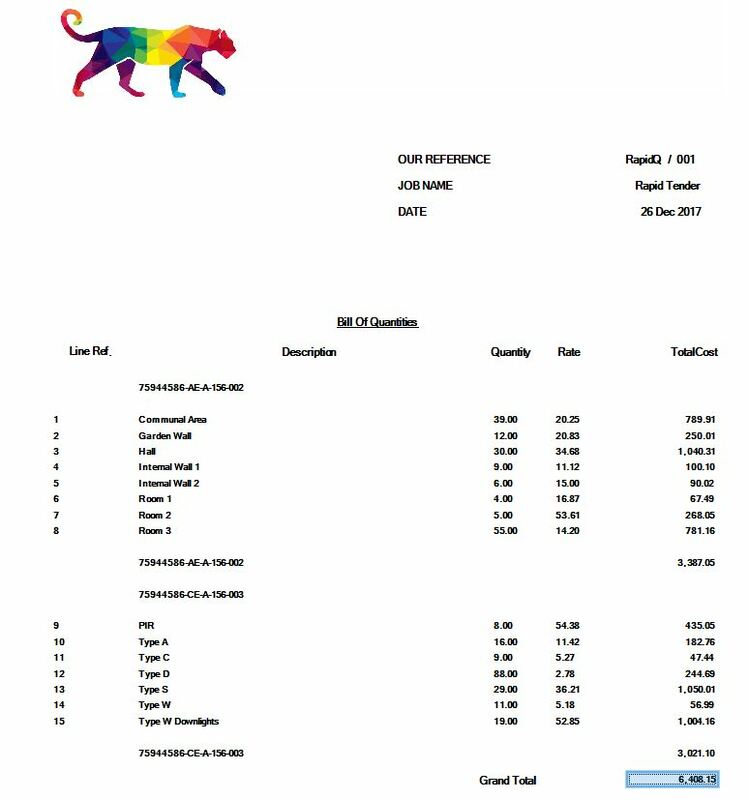 How does RapidQuote UK estimating software work? First off, let’s look how builders, electricians and other contractors from all over the UK usually work. That way, we can see how much effort goes into getting an accurate quantity to produce an accurate quote. We’ve worked with contractors since the 80s, when we started developing computer programs to make their lives easier. And while the world’s changed since then, the way contractors create estimates has stayed the same. You have to get a copy of the plans from architects or project managers or planners. Then you’ve got to check they’re the right drawings. In and out of files, checking and re-checking. 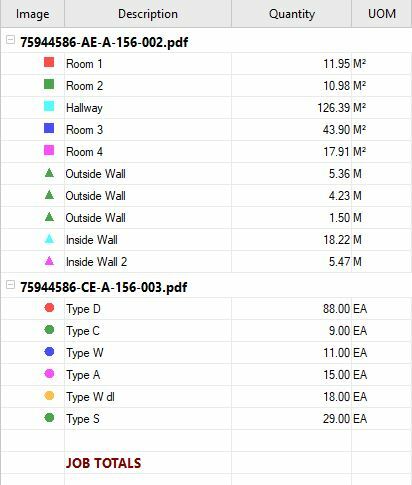 Unzipping PDFs, comparing data. It’s a nightmare. Then it’s off to the printers to spend your hard-earned cash on A0 and A1 sized plans to pore over for the take offs. 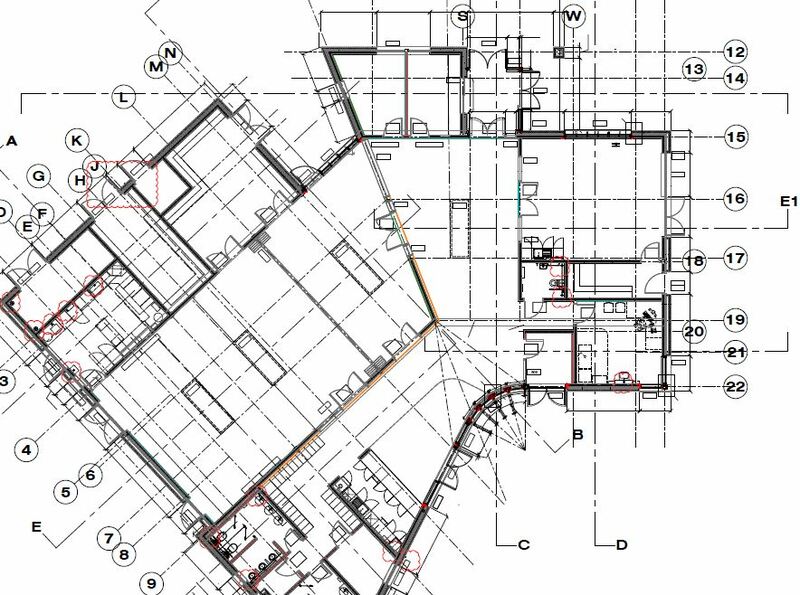 Once those plans have been spread out over a quiet corner of the site office (or more likely your home kitchen table), you need a steady hand and a good eye to scale the plans and colour each type of material the project needs. Then comes the counting. The endless counting, and scribbling on the take off sheet, and the summarizing. It’s hard work, you need to concentrate, and even the best of us miscount now and again, so you need more time to double check. Then those quantities need to go into a spreadsheet – again, some double checking is required – before you drop in the prices and cross reference your rate sheet. Congratulations. You’ve done one set of plans. Now onto the next. And the next. And the next. Counting, summing up and checking totals. Until eventually you’ve got a figure to use for your quote, and it’s taken you five or so hours. 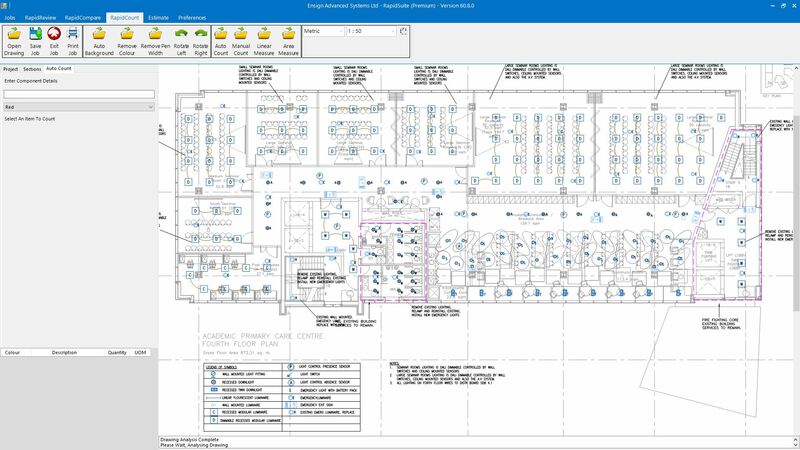 Now here’s how our construction takeoff software works. 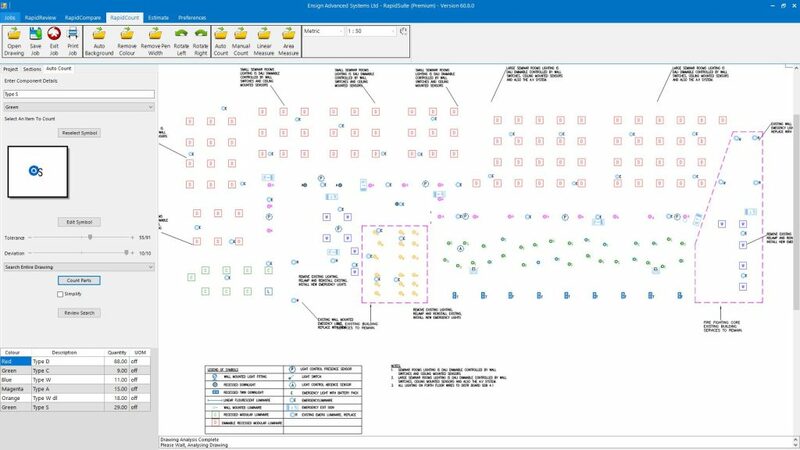 First up, RapidReview lets you grab the plans you need in a few seconds. Instead of clicking in and out and in and out, our software gives you previews that load instantly, turning endless tracking through files into a few yes/no questions. 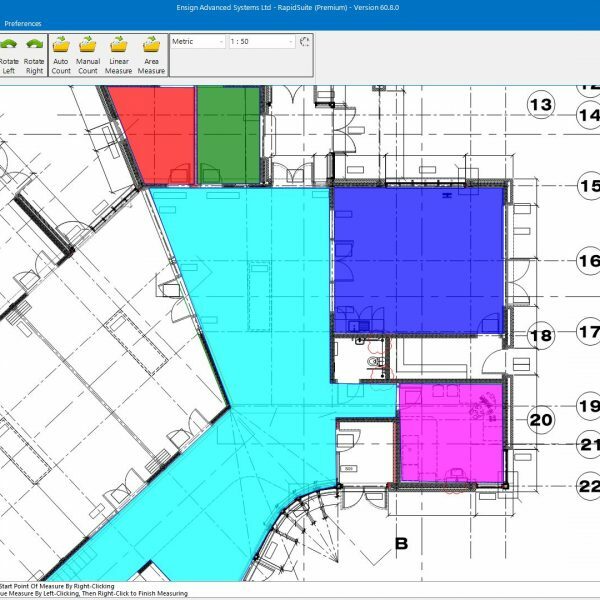 Once you’ve chosen the plans, RapidClear instantly removes any background clutter with a single click, allowing you to easily spot and colour different materials. A few clicks later, and the scaling and colouring is done and out comes the list of quants. 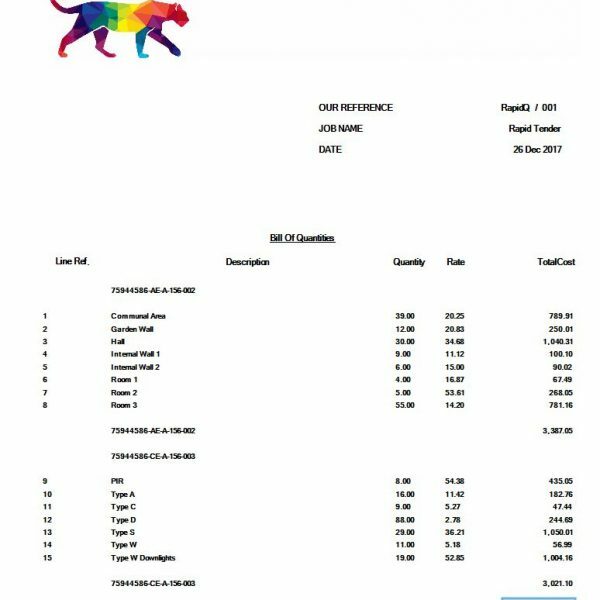 Put in your suppliers’ prices, out come the numbers, and suddenly you’re four hours better off. And that’s before we mention the RapidCompare function that identifies 100% of changes and revisions when you ask it to look at two different drawings! Four more hours to spend on site, four hours to spend creating more quotes and winning more work (some of our clients win 400% more business just because they can create five times as many quotes), or four hours cashed in so you can clock off at a reasonable time. They say time is money. RapidQuote construction calculator proves that a little bit of money gives you a lot of time. To see just how much time you’ll save, use our savings calculator. It doesn’t matter to the software whether you’re a builder, a landscaper or a commercial decorator. RapidQuote’s quantity surveying and estimation software will save you time. Need to estimate the amount of mortar or construction materials your brickies will use when quoting a construction project? It’s perfect for use as builders estimating software, and it’ll free up time for you to spend on site. 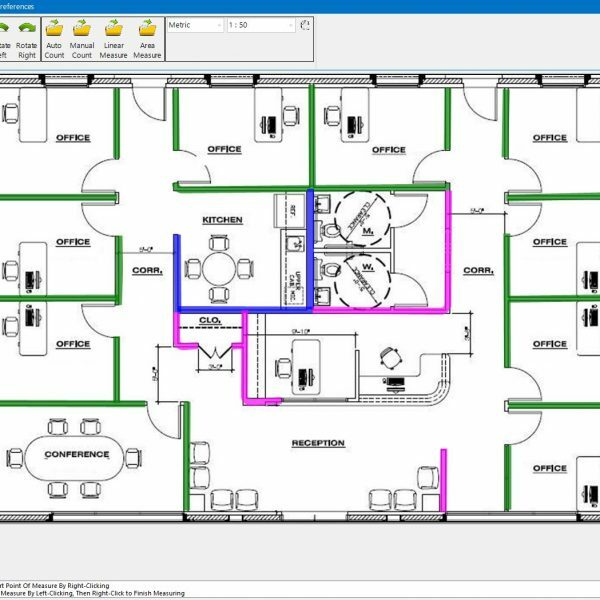 If you’re plotting out how much cabling and how many fuses you need, RapidQuote acts as electrical estimating software to make quoting for rewiring jobs a piece of cake. Because RapidQuote can help you calculate areas and square footage (and translate that into gallons of paint or rolls of wallpaper) it makes decorating and painting estimates simple and easy too. And if you’re worried that a computer program needs straight line interiors and can’t handle plans that involve paths, gravel, shrubs and trees, you can take our word that it’s also designed to act as landscape software for you outdoor landscaping experts. Whatever your industry, you’re a quick demonstration away from seeing just how much faster and more accurate your quotes and estimates can be. That boast at the top of the page? Saving four hours per quote by downloading and trying our takeoff program? We didn’t make that up. 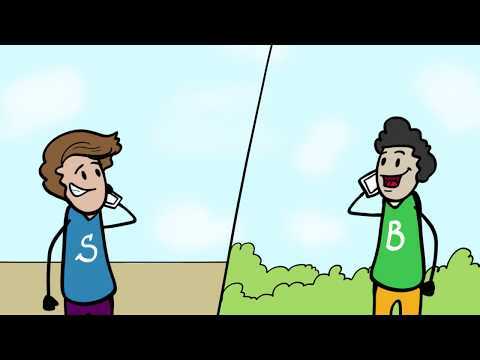 We asked a professor of business psychology at UCLA to test RapidQuote UK. Seems straightforward to us. 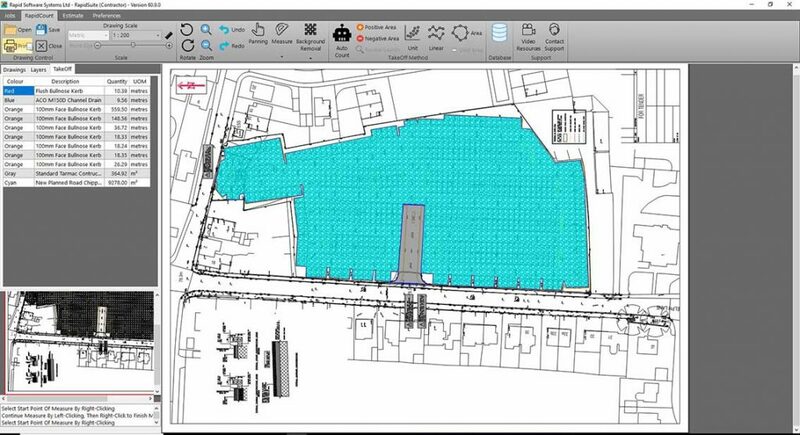 Using our quantity surveying and estimating software saves you time, saves you effort, and gets it right.